Well, like so many others, the weather this past week definitely has me wishing for tulips *grin*. 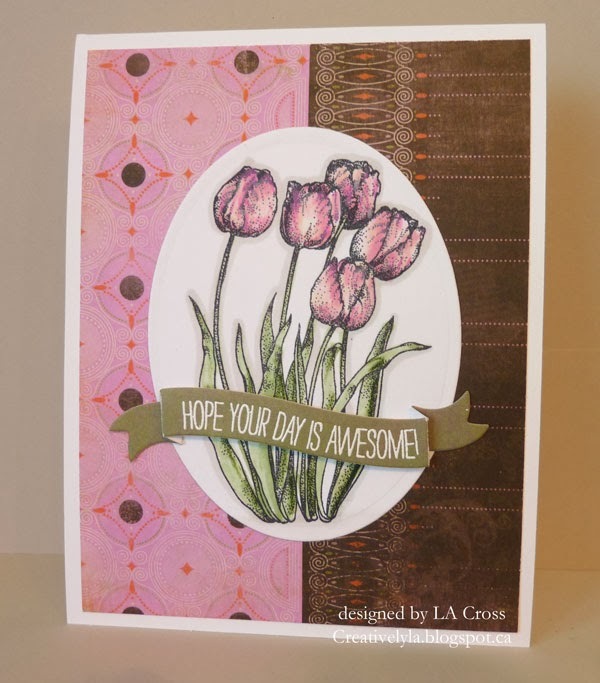 This card is for a couple of challenges over at Splitcoast today…the Queen for the Day, Sandie and the MIX50 Color it Twice. I’ve die cut an oval and stamped it with the tulip image. First it was colored with Copics, and then I added some shading with Prismacolor pencils. It’s been placed over a piece of designer paper and then the die cut sentiment was stamped and heat embossed and placed overtop. Beautiful card Lee Ann. Those tulips are so pretty. Love the pink and brown together. So warm. Absolutely gorgeous Lee-Anne! Awesome coloring!!! This is so beautiful! Everything works so perfectly together! Pretty sentiment banner over your lovely tulips Lee-Anne!